“Wealth isn’t a fact. It's an opinion. I’ve asked REDE to educate me on the financial matters I want to pursue so I can be better informed about my current finances and how I can reach my financial goals. I’m defining my relationship with wealth— and REDEFINING advice.” Please see important disclosure. 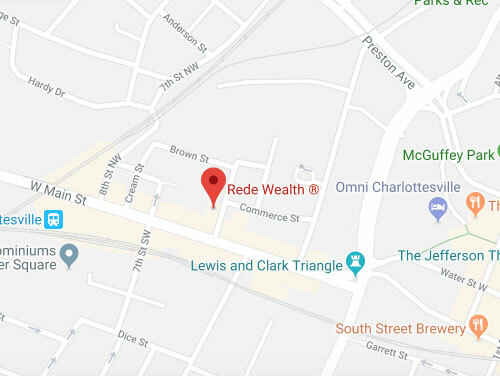 Rede Wealth is an independent wealth management firm based in Charlottesville, VA.
We’re not pinstripes and mahogany desks. We think you’re better with us – not because of us. We don’t pretend to be experts on you because no one knows you and your family better than you. It’s your life; we want to help you live it better. Our advisors provide clear, objective advice while educating our clients about the investment world. In other words, we will do our best to simplify the big picture and put you in control while managing the details you do not want to handle. You get independent financial guidance your way. We believe more people have a foundation for wealth than they currently realize. That is why we do not require portfolio minimums. Plus, our fee-only structure helps us provide high-quality investment advice while minimizing potential conflicts of interest. We chose the name Rede Wealth because it perfectly describes our mission of providing helpful investment advice, ongoing support, and access to our wealth of knowledge so we can support you on your financial journey.